Thursday night at The Knockout began with a long trip down Mission, thinking about food and looking for a sweet spot to find some grub. After some seafood curry and chicken in peanut sauce up the street, we headed over to the show in time to catch G Green setting up their stuff. 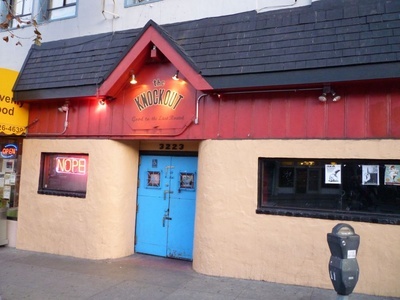 The Knockout is a narrow club with a long bar running up one side of it, a couple of seats and benches and a cozy stage at the end of it all. Between sets a young woman kept the groove alive spinning sweet songs one after another and 2 large video screens silently alternated between bodacious 80’s hair bands and films like The Cabinet of Dr. Caligheri.